Hyundai’s sponsorship of FIFA World Cup 2010 is celebrated in an integrated advertising campaign, online at fifaworldcup.hyundai.com. Two television commercials, Baby’s Name and Die Hard, celebrate the loyalty of fans, both football fans and Hyundai fans. 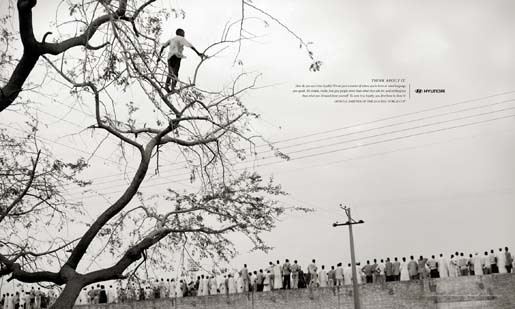 Print advertisements celebrate the concepts of loyalty, beginnings and perfection. 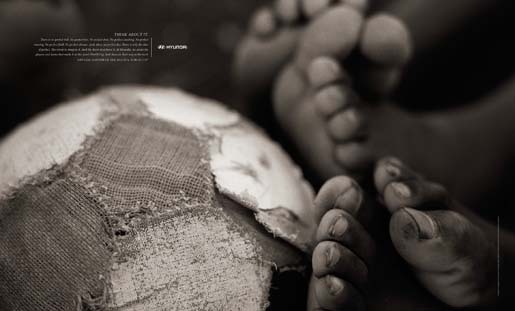 One ad takes us back in the history of football, focusing on the surprise USA 1-0 win against England in 1950. 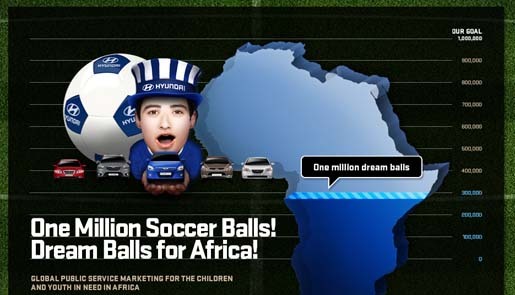 Hyundai’s engagement with the game is taken further with “One Million Dream Balls for Africa”, in which Hyundai car buyers and others can link their names to the delivery of soccer balls to all corners of the African continent through United Nations. Hyundai plans to hold an ‘Africa Road Tour’ in six African nations from July 17 to 31, in South Africa, Nigeria, Ghana, Algeria, Morocco and Egypt. During the tour, Hyundai will explain the Dream Ball project, distribute soccer balls, and exhibit the company’s famous Goodwill Balls, as well as the latest vehicle models. The `Africa Road Tour’ will be filmed for a documentary by the National Geographic Channel and aired in Asia and Europe in August or September. 32 “Goodwill Balls” were rolled through participating countries in the lead up to the FIFA World Cup, collecting messages of support before being taken to South Africa. 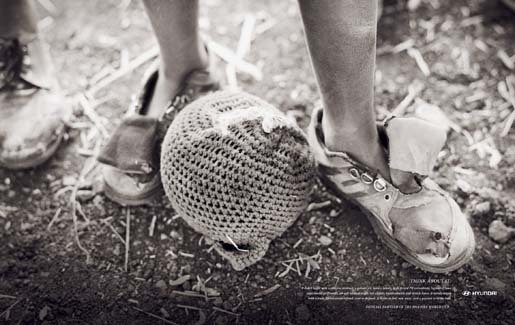 Hyundai’s FIFA World Cup campaign was developed at Innocean by executive creative director Jeff Spiegel, creative director Doug James and Robert Prins, art director Jera Mehrdad and copywriter Steve O’Brien, account director Richard Cran and account executive Lara Trapasso. Photographers were Nadav Kander and Peter Marlow. Filming was shot by director Rocky Morton via MJZ with director of photography Kris Kachikis, executive producer Jeff Scruton, producer Donald Taylor, production manager Alana Mitnick. Editor was Paul Martinez at Arcade Edit with assistant editor Andy Trecki, managing partner Damian Stevens, executive producer Deanne Mehling and producer Ali Reed. Music and sound design were produced at Stimmung by executive producer Ceinwyn Clark.